Folle Blanche is a difficult grape to get to know because it is known by different names in different regions of France. It originally came to attention on the South-West coast of France because it is the main grape in both Cognac and in Armagnac. The area where Cognac is produced is centered on the Charentes and Charentes-Maritimes departments which form an arc just to the north of the city of Bordeaux. Armagnac, on the other hand is produced south of Bordeaux in the departments of Gers, Landes, and Lot-et-Garonne. However, the grape has also migrated north to the area to the west and south of Nantes where it is more commonly called Gros Plant, which is French for “big plant” due to the rapid growth displayed by the vines. It is also called Picpoule in some areas but is not related to the Picpoul (Picpoul de Pinet) found in the Languedoc area of southern France around the village of Pinet. 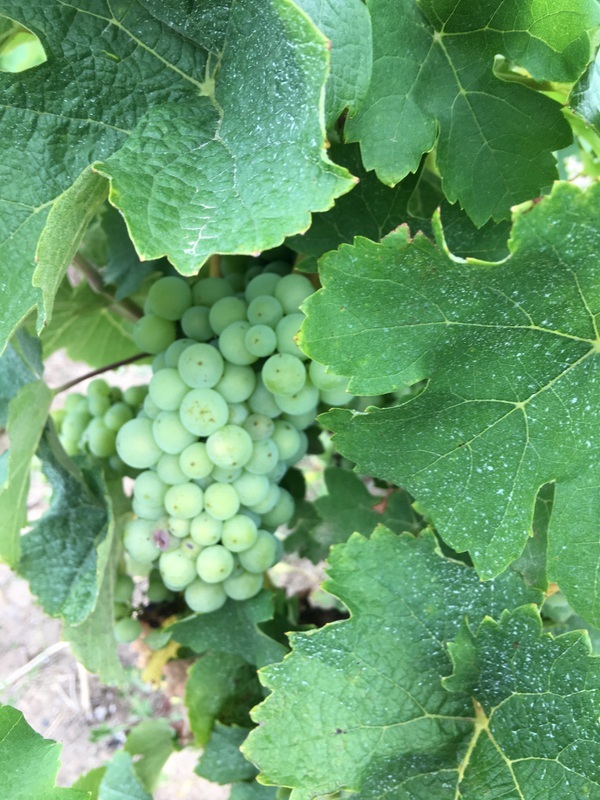 There is some evidence that the grape originated south of Bordeaux because there are many local grape varieties there that have been shown by DNA analysis to have descended from Folle Blanche, including Baco Blanc and Jurancon Blanc.. 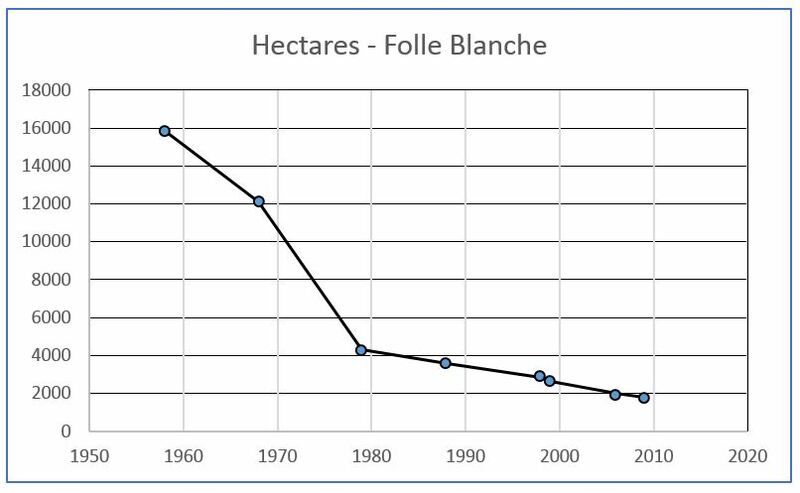 It is also known that Folle Blanche is a descendant of the famous Gouais Blanc but the other parent is still not known. There is little question that the plantings of this grape have been in decline over the past fifty years. The graph below shows this decline between 1958 and 2009. 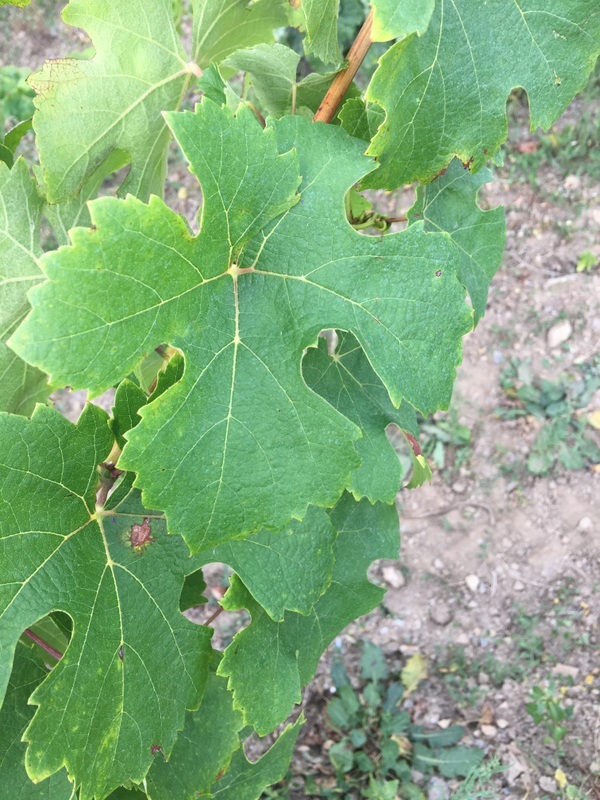 The vine leaves have three large lobes and two small lobes as shown in the photo below. These lobes are reminiscent of those displayed by the Ploussard vines in the Jura, although the two are not related in any way. The large greenish grapes are clustered into tight bunches which makes them somewhat vulnerable to disease pressure. 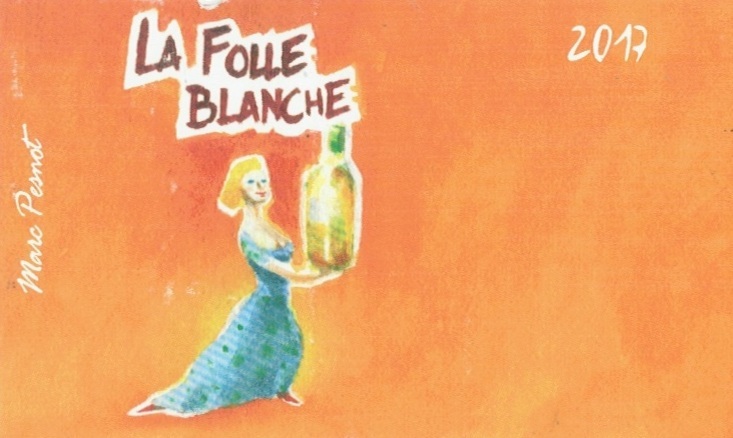 We are lucky enough to import a wine which is a great example of the Folle Blanche grape variety from Marc Pesnot called La Folle Blanche, the label of which is shown below. This wine is made from grapes that have been hand-picked from vines that are over 60 years old. No sulphites have been added to this wine.